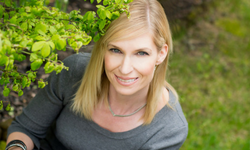 Seeme & Liz > General Parenting Tips > Help For The Shy Child: Is It Absolutely Necessary? 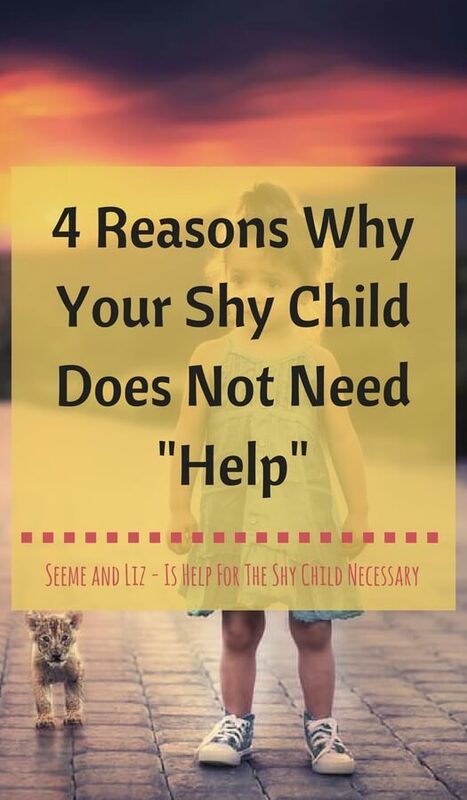 For those of you who don’t like to read lengthy articles, the answer to the question “is help for the shy child necessary?” is NO! So if you have a shy child, do not get worried that there is something wrong with him/her. Being shy is a personality trait. Just like having an accent is not a speech disorder. It’s simply a difference. If you do like reading, continue on and I will discuss why a shy child does not require any kind of therapy. 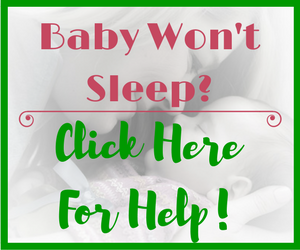 I will also share some tips for how you can make the world a more comfortable place for your little introvert. I am mom to a very shy daughter. And a not so shy son. They have both been raised the same way by the same 2 parents, so it most definitely seems that shyness is a personality trait. My daughter is now 10 and is coming out of her shell more and more each day. She no longer fears new social situations the way she used to. She has many friends and loves having “parties”! She still finds it difficult to talk to adults, but she has come a long way from the (extremely) shy preschooler that she was. I still vividly remember dropping my daughter off for her first day of daycare when she was close to 3 years old. She clung to me and cried and cried. Eventually she stopped (after I left) and was fine for the rest of the day. She attended daycare once a week for the next year and a half. According to the daycare teachers she didn’t speak to them until the last month. Then, when she chose to speak it was always in a whisper and she would use only a few words at a time. Her teacher told me that if they hadn’t known my background was in Speech-Language Pathology, I would have received a phone call expressing concerns with my daughter’s ability (or lack thereof) to speak. This went on during her Kindergarten years as well. Her teachers were lucky if they heard her voice. However, she did start speaking when spoken too. She was also overheard speaking to 1-2 classmates that she felt very comfortable around. Some children are outgoing and some are not. How often do you hear a parent say “my child is outgoing, should I be concerned?” Probably never. Our society values extroverts and leaders because they stand out from the crowd. Being outgoing is often associated with being more successful, usually because extroverts are more likely to try new things, whereas introverts like what is familiar and comfortable. But I can assure you that there are many successful introverts. I, like my daughter, was extremely shy as a child. Sometimes to the point of awkwardness. As I got older and more comfortable with the world around me, I came out of my shell. Most people would never guess that I was shy as a child. All that being said, make sure that you don’t jump in to rescue your child all the time (speaking on their behalf). He will need to learn to do this on his own! Because shy children do not like attention placed on them, they take everything in around them. Shy children are always learning from others. Even though they might not engage in conversations they are very aware of what is going on around them. I was very surprised at how well my daughter did in school (in Kindergarten) because she never participated much. Her teacher said that she has seen this many times with shy children. These children are very aware of their surroundings and know what makes others happy and sad because they are always watching. Shy children also tend to be quite emotional. They often treat others with kindness and demonstrate empathy because of their own feelings. Their minds are always going and thinking because they aren’t busy talking. 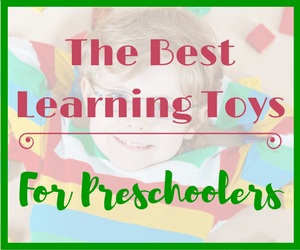 Shy children can spend a lot of time on their own coming up with many imaginative play scenarios. There are many famous people who are self proclaimed introverts. Many of them found ways to overcome their extreme shyness, but others did not and embraced it. Some of these include Albert Einstein, Rosa Parks, Bill Gates and many more. Allow your child to be who he is. Don’t look at being shy as something negative, because it isn’t. It is just one of many personality styles. Don’t label her as “shy” because shyness is not a disorder that needs to be fixed. Try not to draw attention to the shyness, rather accept your child for who she is. Let her know it is OK to not want to talk all the time. Help her find social situations in which she can be comfortable. For example, set up play dates with friends you know she is comfortable with. If your child is young and the environment is new, stay with your child the first few times. Then slowly try to distance yourself. It may take your shy child longer to do some things than expected. 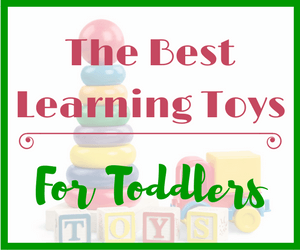 Prepare your child by easing her into situations. I knew my daughter would have a hard time going to school which is why I found a great daycare program for her to attend one day a week before starting school. I went with her to check out a few different programs before deciding on the one I thought would be best. I knew that I wasn’t going to home school her so I wanted her to be comfortable being without me before attending school on her own. Don’t overprotect your shy child. He needs to learn how to adapt in social situations. Prepare him as best you can. If talking in a big voice causes him anxiety, allow him to answer questions by speaking quietly. However, try to encourage your child to make eye contact with the speaker as this is very important in social interactions (in Western Cultures especially). But don’t push it. Try not to feel embarrassed because your child comes across as awkward. Also, avoid making excuses for your child. I know from personal experience this can be difficult. We all want our children to fit in. But by feeling embarrassed and making excuses to explain your child’s behavior you are basically saying that there is something wrong with your child. Children are smart and they can pick up on these things. Some children outgrow their shyness whereas others learn to use it to their advantage. If you have a shy child and you need to send them to a daycare program from a young age, be prepared for many tears. This is OK. Your child will make it through this period. It will probably be more difficult for you having to see your child like this. 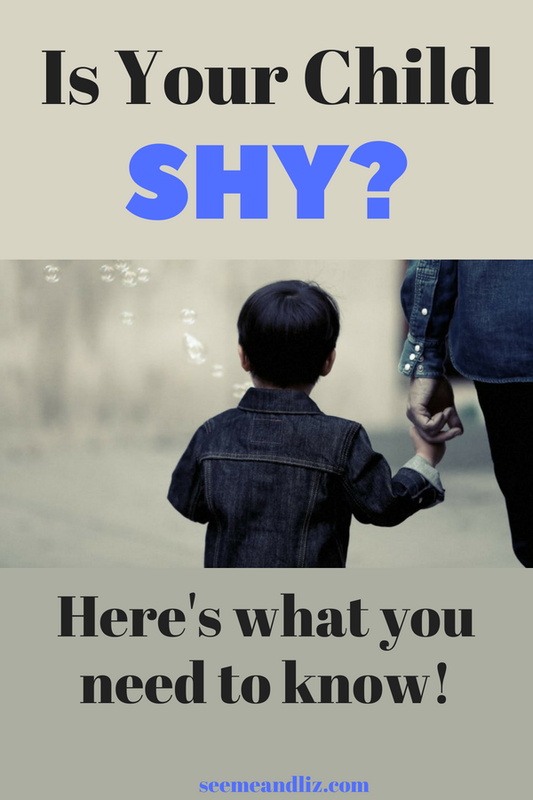 When To Be Worried That Your Child Is Too Shy? If your child expresses extreme fear in social situations despite the situation no longer being new or has emotional outbursts in social situations thus trying to avoid them, your child may have social anxiety disorder. Or your child may have selective mutism which is a much more extreme form of “shyness”, where a child will not talk in certain situations for an ongoing period of time. If you think that this might be your child, please seek the advice of a professional such as a child psychologist. Do you have a shy child? Were you shy as a child? 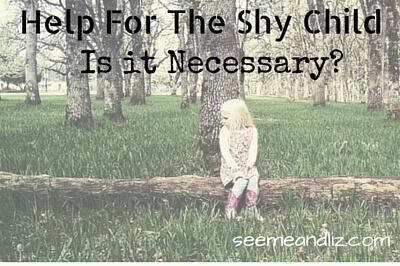 Do you have any tips for parents of a shy child? Do you feel that help for the shy child is necessary? I have one child who used to be incredibly shy. He was the kid who could not be left alone at birthday parties, would cling to me at play dates, and sobbed at daycare drop off. It broke my heart because I was also very shy as a child and I know it made things much more difficult for me. I used to get so frustrated not knowing the right thing to do. Eventually he did come out of his shell, and now if you met him you’d never believe that he was so shy during his first few years of life. He will always be quieter and more introspective than my other kids though, and that’s ok. I was also (awkwardly) shy as a child. I remember it always embarrassing my parents. I came out of my shell in my teenage years. I’m happy to hear that your son is doing well despite being extremely shy as a young child. 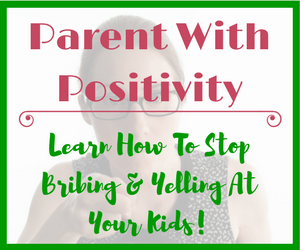 As long as parents support their shy child as best they can they are doing a great job! I clicked on this on Twitter because I was upset that being shy was going to be described as a disorder. I am thankful to find the opposite. I was a shy child who was bullied by whole family for my shyness. It marked me for life. I do not interact with my family much these days! I am sorry to hear how you were treated as a child because you were shy. That is terrible. My daughter is very shy, awkwardly shy at times. Although now that she is 10 she is coming out of her shell a bit. I’ve had well meaning people suggest I take her for therapy so she doesn’t have social challenges later on. That was one of the reasons I wrote this article. I want people to know there is nothing wrong with being shy. Not everyone is going to be outgoing and that is ok! Thanks for writing this article as many parents like us are always very concerned about our own kids. Like it or not, shy kids have some disadvantages during their early days in school especially in today’s school education with emphasis on public speaking event at the age of 4!!! I would say some shy kids may not have problems but need to pay special attention if the shy kids tend to behave differently from other kids and also how they cope with the school. There is a thin line drawn between shy kids and kids who may need help like speech therapy and/or occupational therapy. Just be observant with your kid and there is no harm in getting your kid seeking help at early age so that he/she can resume back to main stream as early as possible. Yes, I fully agree with you that shy kids are super observant and they practically listened to what you said over the phone. Thanks for sharing this post with us. Thanks for your comment Stanley. Yes, she children definitely will have a harder time in society and school than more outgoing children. However, being outgoing also has its challenges (like getting in trouble for talking too much). When my daughter was younger (and more shy) I made sure to talk with her teachers to let them know about her struggles. The teachers were all very understanding and wouldn’t push her to hard. If a child has a true speech and language issue, it will be more obvious than them simply appearing shy. Most shy children are not shy at home, so parents would have an idea what their child is capable of. But I do agree with you that it is better to seek help early than hope things will resolve on their own. That’s a very interesting post on a shy child being an introvert child. Some of the traits of a shy child could help them overcome their shyness when they mature. 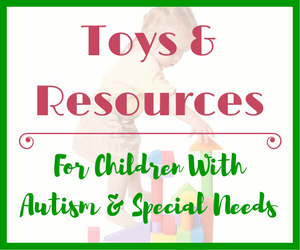 It is part of the process of growing up for a child and it can be tough for a shy child . Anyway, great post and it is easy to absorb the information that you have presented. Thanks for your comment Steve! Yes, typically children who are shy are also more introverted.